What is the Barker Breaker? How can it stop a dog barking? 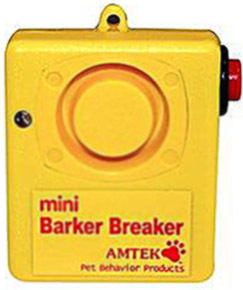 Can the Barker Breaker work for small dogs? Can you use the Barker Breaker on a collar? This is a dog training device that’s designed to be compact enough to hold in your hand. It works like many other devices out there: by letting off a high pitched sound. It is not an ultrasonic sound, however. That means you can actually hear it yourself (check my guide here if you are looking for ultrasonic dog training devices). You also need to activate the sound yourself on the Barker Breaker, i.e it does not automatically detect a dog’s bark (check?? has a microphone that “only detects barking”). This can have its upsides (no false alarms), but this is a device for people who just want full control or who want to use it as a training device. 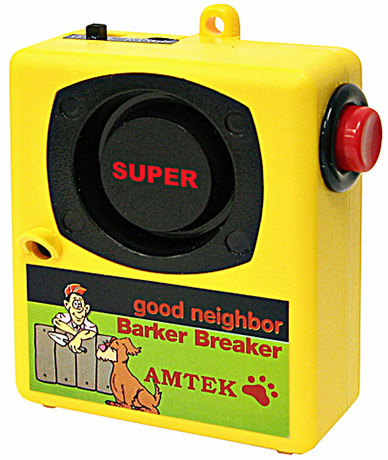 The company behind the Barker Breaker, Amtek, has been around for 35 years with a focus on creating products that humanely keep wild animals away from people’s homes, to safely and humanely keep pets away from areas you don’t want them to go, and of course, bark control with their Barker Breaker range. Amtek is a USA based and owned business and their products are made in the USA. You activate the sound as soon as the unwanted barking happens. 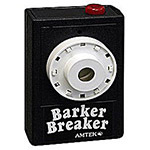 The Barker Breaker then emits the audible sound, which is meant to interrupt the dog. HOWEVER for many people – this is just stage one of the process. If a dog is to learn that the barking is to stop, the sound cue needs to be followed up with additional training methods so that the dog doesn’t become used to, and immune to the sound of the Barker Breaker. In other words: use the Barker Breaker to get a dog’s immediate attention, then use an appropriate method of distraction and deterrence to ensure he does not just start barking again. How you do that will depend upon your own training preferences and methods. A recommended method is a simple one: following up the sound with a vocal command such as STOP, or SIT. The idea is to train your dog and as always, consistency is key. Certainly some dogs will react well enough to the sound alone, and this may even stop the problem completely for some. When it comes to using a Barker Breaker to stop a neighbor’s dog from barking, you’ll need to approach it a little differently. (talk about the neighbor model). As you would guess from its name, this was the first Barker Breaker model, and the Original BB is often still the one you’ll mostly see being sold. To get the most out of this little unit, you need to aim it at the direction of the dog then press the button. Naturally, this requires you to be physically there when the dog is barking so you can activate the sound by pressing the big red button. The sound is loud enough to travel up to 50 feet in distance, provided there are no major obstacles in the way (such as a tall brick wall for instance). The original BB is a “carry it with you” unit and in that regard, it’s designed well for the purpose. Keep in mind that these are only “cons” if you’re looking for a remote bark control device. And there are plenty of other options to consider if that’s going to suit your situation better. 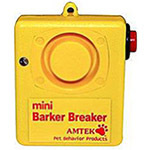 The other Barker Breaker’s are tailored more for using on your own dog’s barking, as a training tool. The Good Neighbor version is, as the name suggests, more ideal for using to help stop your neighbors dogs from nuisance barking. Unlike the Original and Mini, this one is mountable so you can put it somewhere in an ideal place, and leave it there. It also has a belt clip, and it’s just as compact as the other models if you want to carry it around. 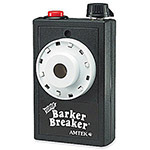 This is a two-in-one Barker Breaker – it can do both remote and manual operation. Remote bark control lets you mount the device, pointing towards a neighbor’s yard where their dog regularly barks, and have the GNBB detect the barking with its built-in microphone sensor and activate the sound automatically – the goal is to disrupt and distract the dog from barking. You can also use it as a training device with your own dog, like the other barker breaker models. This model is equipped with a feature that lets you set the sound to a low or high level. So, if you’ve got it mounted for outdoor use (it is weatherproof, but not waterproof, so make sure it’s protected from direct rain) you can set it to a higher volume. And when you plan to use it indoors with your own dog, you can set the volume lower so its more suitable for an indoor environment. Some people even use a BB in the car to train over excited dogs. Being a Good Neighbor goes both ways, and some people choose to use this unit to protect their neighbors from their own barking dogs. People who keep multiple dogs in kennels, where barking can be a big issue, are able to set up this GNBB near the kennel and have it detect barking, and activate automatically when needed. 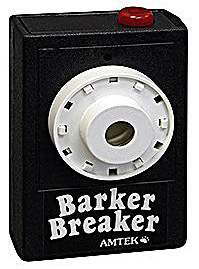 Because you are able to hear the sound, you’ll know when (or when not) the Barker Breaker is activating. These extra features make the Good Neighbor Barker Breaker the most flexible of all four of these models. The Original Barker Breaker and other models are small enough to fit in the hand, but the Mini is even smaller. It also has the button on the side, rather than on top. Apart from these design points, there’s not a big difference between the Mini and Original BB models. The Mini BB does have a belt clip so can be more convenient to take out walking or wherever you go with your dog. They both essentially function identically though. Even if none of the BB products are what you’re after, there’s plenty of other choices out there. The obvious alternative is that of ultrasonic, remote bark control units. If you want or need something that emits a sound that humans can’t hear (unlike the Barker Breaker, which is audible by us and that has its benefits too), ultrasonic is what you’re looking for. 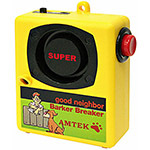 The Super Barker Breaker can detect barking after you’ve pressed the button, and can then operate on its own until it detects the dog has stopped barking. But the Original requires you to operate it. If you want to mount a device in one location, consider the Good Neighbor model. You can use the BB for any dog, no matter what size or breed. Like any anti-barking device, there can never be a 100% guarantee that it will work effectively with all dogs, or that all dogs will react to it. It is said that it will however work with most dogs. The key to getting good results when using these products with small dogs (and any dogs for that matter) is consistency, and ideally using it as one part of a bark control regime – especially if its your own little dog with the excessive barking problem, who you can combine the BB with suitable positive reinforcement training. No, this is not a bark control collar device. It’s a handheld unit, or a mountable device. You’ll need to look at anti-barking products that are either specifically made to fit to a dog collar, or comes as a single unit built into the collar.